There’s something I wait for every year, one thing that keeps me anxiously counting the days once that first autumn breeze makes itself felt. No, I’m not talking about New Year’s celebrations or Tokyo’s one yearly snowfall. Instead, the part of winter in Japan that gets me the most excited is the appearance of the fruit known as “yuzu,” which is sometimes called “citron” in English. Yuzu is a round yellow citrus fruit that is smaller than an orange, with a unique smell that simply cannot be described in words. Unlike other citrus fruits, the flavor and aroma of yuzu are concentrated in its skin that is either zested or cooked and eaten. 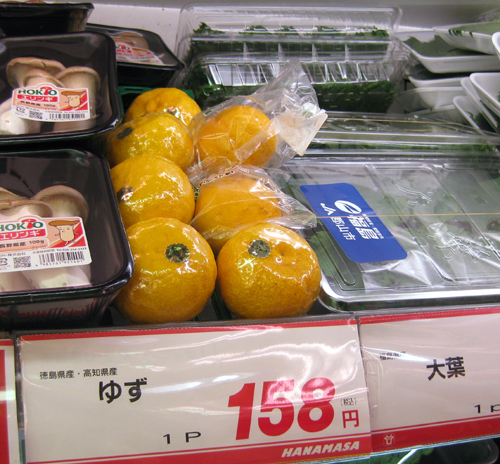 Yuzu skin is used to add a bright accent to many winter foods such as simmered root vegetables. It is also incorporated into many dishes that are part of traditional New Year celebrations, like the ozōni soup that is served on the first morning of the year. If you were to taste yuzu juice by itself you probably wouldn’t think it was that worthy of notice since the juice actually resembles lemon juice a great deal. This is where some recipes go wrong – if your recipe calls only for yuzu juice and not yuzu zest, it’s always a good idea to put some zest in as well to ensure that you retain the real smell and flavor of yuzu. 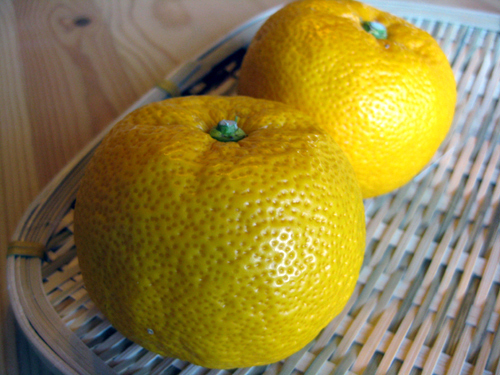 Yuzu is also widely used in both beverages (many alcoholic) and desserts. I’ve had yuzu sours, yuzu soda with lemon, green tea with yuzu, yuzu cheesecake, yuzu candy, manjū buns filled with yuzu and white miso, candied yuzu skin, yuzu jam, yuzu white chocolate, yuzu shortcake, and many more delicious yuzu offerings. Yuzu is often made into ponzu, a citrus-flavored soy sauce that is used for dipping vegetables from hot pot dishes or made into salad dressing. The only way that yuzu is definitely not eaten is by itself like an orange. I’ve even bought yuzu shampoo and body soap. And speaking of bathing, yuzu are sometimes floated in hot bath water to perfume it (and the bather) with their fragrance. I wasn’t always so crazy about yuzu, though. For me this particular fruit was an acquired taste. It took a few years for my nose to learn to appreciate the aroma of yuzu, which is somehow both flowery and a bit pungent at the same time. Now I like to keep a couple of yuzu in my refrigerator constantly from the time they come into season, so they are always at hand for garnishing vegetables or noodles, making pickles, or whisking into salad dressing. Generally on this blog I will try to give suggestions for ingredient substitutions or encourage people to try making a Japanese-style recipe with familiar vegetables if something happens to not be available locally. Yuzu is an exception because I don’t think there is another citrus fruit that is even remotely similar. If you’ve never tasted or used yuzu, do yourself a favor and try one even if it means convincing your local produce guy to put in a special order. Yuzu is becoming gradually more popular out of Japan, so I bet that it isn’t that hard to find in most places with a decent selection of Asian food. And if you do get a hold of some yuzu, here are some recipes to start with. Yuzu Kit Kats! My favorite flavor so far. I’ve never even seen a yuzu Kit Kat but that sounds so good! 😀 You should definitely try a real yuzu if you run across one. The Yuzu drink they have on JAL flights (and rare conbinis & vending machines) is awesome, as is yuzu-shu. Yuzu is awesome. Yuzu cheesecake and desserts are pretty much always a win.. and the best alcoholic drinks I’ve ever had are usually yuzu flavored (yuzu-shu anyone?) but there’s something so simple and comforting about a simple salad served with yuzu peel and juice. yum! Yuzu and booze do make a fantastic combination for some reason…maybe it’s that slight hint of bitterness in the yuzu peel? I actually mentioned the Golden Spoon frozen yogurt in my original post, then cut it out because it was in a particularly long winded section. 😉 Such a disappointment though, especially considering how delicious their pumpkin pie is!